Male infertility due to astheno, terazoospermia. ● Asthma Maintenance, Chronic Fatigue Syndrome (CFS), Depression, Fibromyalgia Syndrome, Heart Disease, Atopy, for brain and retina related diseases and recovery. ●For improving physical performance, reduce blood sugar, and reduce the toxicity of certain cancer treatments, for allergic and other autoimmune conditions, Arthritis and for Hypertriglyceridemia. EPA and DHA is an essential fatty acid which stands for Eicosapentaenoic Acid. and Docosahexaenoic Acid. DHA is a physiological-essential nutrient in the brain in retina. It's needed in high amounts for providing optimal mental performance and visual acuity. It also contributes to proper neuronal function and cognitive function. It helps with forming neural transmitters, such as phosphatidylserine, which is important for brain function. DHA has a role in supporting electrical signaling and ultimately brain functioning such as learning ability and memory. EPA also contributes to brain functioning by increasing blood flow and influencing hormones and the immune system, which ultimately effects the brain and it's functions. It also has ability to lower the inflammation. Many studies have suggested that deficiencies in DHA and EPA omega-3s are linked to many behavioral conditions like depression, ADD, ADHD (Attention-Deficit Hyperactivity Disorder), anxiety, postpartum depression, bipolar disorder, and even Alzheimer's disease. EPA and DHA are converted into hormone like substances called prostaglandins, and they regulate cell activity and healthy cardiovascular function. 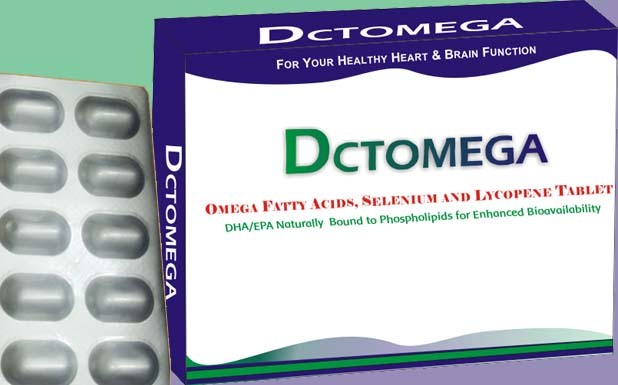 DHA plays a very important role during fetal development, early infancy, and old age. Taking EPA DHA may also help with mental abnormalities, such as Alzheimer's Disease and Dementia. Lycopene, a carotenoid without provitamin-A activity, is present in many fruits and vegetables. As a powerful antioxidant, lycopene helps neutralize harmful free radicals, which are implicated in cancer, heart disease, macular degeneration and other age-related illnesses and may prevent osteoporosis and can assist with fertility problems in men. Selenium could be your most potent ally against cancer. Most of effects of selelium related to the function of selenium in the antioxidant enzyme systems and appears to regenerate vitamins E and C so that they can continue to fight free radicals. Selenium is one of the antioxidants that may help to inhibit LDL oxidation. Moderate be cautious with this combination with Warfarin, Anticoagulate drugs, Statins (or Hamoglobulin –Coenzyme A reductase inhibitors). Hypersensitive conditions its dosage could be taken under Doctor’s Prescription.